Bobby pins are a girls best friend, however some of you out there may not be making the most of them. Luckily I know a few tricks that help maximise these tiny hair heroes! The first trick is to simply use them the correct way. Now, this may or may not shock you, however you are supposed to push bobby pins into your scalp with the wavy side facing down (as shown by the arrow above). Placing the wavy side face down will provide a better grip on the hair, preventing the bobby pin from sliding out. Another quick trick is to spray the bobby pin with hairspray or dry shampoo before inserting it into the hair. This will give the bobby pin an even firmer grip and will also give it stronger hold on fine hairs, avoiding any fall out. I recommend using either the Batiste Dry Shampoo Blush 200ml (£2.99 Boots / $7.99 ULTA) or the TRESemme Ultimate Hold Hairspray 250ml (£2.69 Superdrug). Finally, Jamie Stevens, X Factor Hair Stylist for TRESemmé, suggests spraying hairspray on to the section of hair where your bobby pins are going to be inserted. 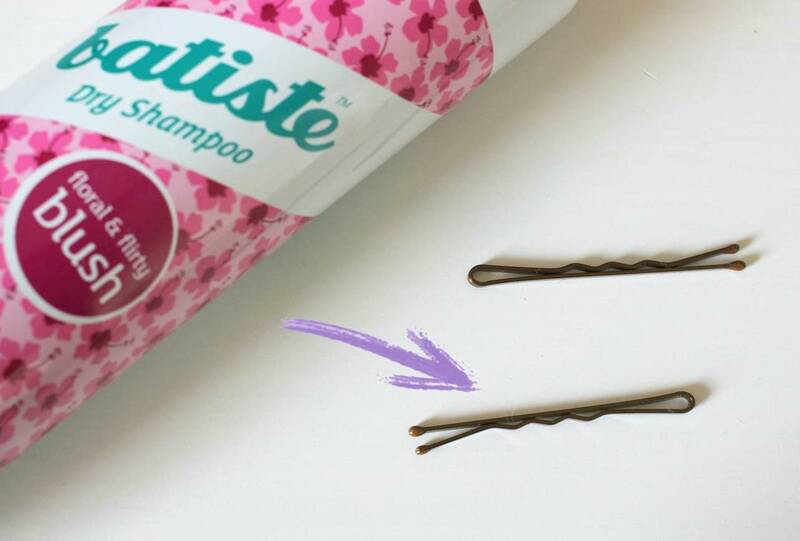 "This will help keep the bobby pins in place for longer - helping you avoid using too many, which can look messy" says Jamie.